Osteopathy - that's backs isn't it? Last year we had an open day at the practice to celebrate 5 years of being in East Hoathly. One of the reasons was to allow people to come and ask any questions they had about Osteopathy and also to eat cake! There are some common concerns about Osteopathy that came up and come up on a regular basis so we wanted to address them here. Firstly, is about backs. Yes, we definitely treat backs. We can help to reduce tension and stiffness to improve mobility and to reduce pain. However, we can treat muscles, tendons, joints and ligaments in any part of the body. This means we are able to treat tennis elbow, frozen shoulder, arthritic knees or dropped arches. We are also able to release tension in the neck and around the base of the skull which can in turn relieve headaches. This brings me on to the second area that many people worry about: the cracking of necks. Many Osteopaths safely 'crack' necks day in and day out, screening their patients for contra-indications to make sure it is safe before they do. 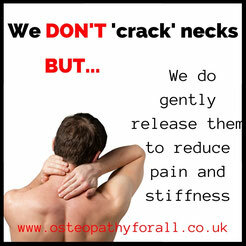 At Osteopathy For All, all our Osteopaths choose NOT to manipulate(crack) necks. We are able to release all joints effectively without needing to use this technique. We all tend to use the more gentle range of Osteopathic techniques especially when treating children. The other thing that concerns people is that fact that we are 'alternative or complementary practitioners'. We can be a good alternative or very complementary to your ongoing medical care...even the latest NICE guidelines recommend Osteopathy and exercises above painkillers. However, we are Primary Care Practitioners. Our extensive training is similar to that of your GP. We complete 4 years of anatomy, physiology, pathology, neurology, endocrinology, radiology and all aspects of medicine, except surgery or in-depth pharmacology, as well as our Osteopathy. This enables us to be able to diagnose you. It also means we know when we cannot treat you and need to send you back to your GP. We are also trained to have a good understanding of exercise and lifestyle advice. We are the total package and we are continually assessed and monitored by the General Osteopathic Council to ensure excellent practice standards.